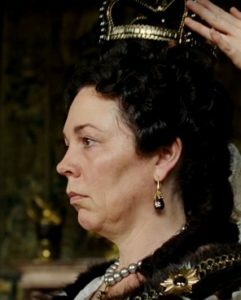 The reign of Queen Anne (1702-1714) is but a footnote in the history of Great Britain. Her monarchy’s greatest achievement is that it was the first to rule both England and Scotland under the umbrella of “Great Britain.” Anne was afflicted with poor health most of her adult life, and battled obesity during her later years. She held a close friendship with Sarah Churchill, the Duchess of Marlborough, and despite 17 pregnancies, was unable to provide an heir to the throne – thus making Anne the last monarch of the House of Stuart. Why her brief dynasty should be the subject of a major motion picture in 2018 is beyond me, but then Yorgos Lanthimos’ “The Favourite” is really a film about female catfighting and backbiting, which simply uses the throne of Queen Anne as its backdrop. Screenwriters Deborah Davis and Tony McNamara apparently harbor no desire to provide any semblance of historical context in which to frame their tale of aspersion and backstabbing. 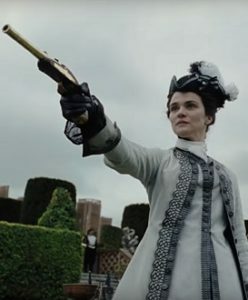 Thus, “The Favourite” plays out like a wannabe stepsister to Stephen Frears’ far superior “Dangerous Liaisons” from 1988. In “The Favourite,” Olivia Colman plays Anne as a flustered blowhard more concerned about her pet rabbits – she has one for each of her miscarriages – than the governing of the state. Political discussions and those of the war between Britain and France bore her, and she’s given to occasional fits of fury. When she opens her window and screams at a string quartet on the lawn below to stop playing, we’re supposed to laugh, but her ire comes off as petty and her bombast as insincere. Rachel Weisz plays the duchess, ever doting on the queen to curry her favor, although we’re never certain why, as she would appear to be the queen’s only true friend. The Duchess is far more in tune with matters of the state, and essentially runs the country while the queen lounges about the castle. Later, we learn their relationship is not just personal, but also sexual – although no historical documentation seems to support such a relationship. Into their lives comes Abigail Hill (Emma Stone), a cousin of the duchess, whose father has recently “lost” her in a game of poker. Abigail needs a job, and the duchess is only too eager to help a family member. But soon Abigail cajoles her way into the queen’s heart at the expense of the very cousin who gave her a job during her lowest moment. The meat of “The Favourite” concerns the lengths at which the duchess and her cousin go to be the queen’s primary confidant. What is never explained is why anyone would want to harbor friendship with a woman presented as nothing more than a gasket-blowing dingbat, save for a place close to power – nor why two cousins who have no apparent historical reason to hate one another do exactly that. Again, it’s as though the historical context of the reign of Queen Anne is superfluous to the structure of the film; it’s nothing more than the setting. The real story is the catfight between the two cousins. And though it comes off as pathetic, we’re supposed to find this amusing. Shot in an inexplicably wide-angle lens, Lanthimos has given us one of the year’s worst films. “The Favourite” is set in the early 18th century, yet is chock full of modern-day sexual references, lesbian relationships, and enough projectile vomiting to dissuade the most eager filmgoer from its recommendation. Ironically, Lanthimos also directed one of last year’s worst pictures – “The Killing of a Sacred Deer,” in which a surgeon befriends a mysterious teenage boy who causes illness among the surgeon’s family members. These Lanthimos films are not heartwarming Kumbaya fare. That we’re supposed to find them entertaining is puzzling. It’s one thing to direct films from the head versus the heart. To wit, Stanley Kubrick was always thought of as an intellectual director – as opposed to Steven Spielberg, who directs from his heart. But that doesn’t mean Kubrick’s material is off-putting or repulsive. Lanthimos could take a cue or two from the master. In the meantime, “The Favourite” is one to skip.